I love how the side that touts bullying as being abhorrent is the one that puts out articles like this. @PoliticalOtters, fight fire with fire? @PoliticalOtters, But is it bullying to bully, a bully, or is that more like go around comes, around? @Erebus, Not really, and from what I hear, and considering how their son turned out, they were probably some shîtass people, themselves who shouldn’t be free from ridicule. However, in my opinion, it’s not really productive to try and call someone out because they look weird. You’re only showing that you can go low, too. @PoliticalOtters, Democrats : "Bullying is bad." Some random guy admist millions who happens to be a democrat. : "Ha! 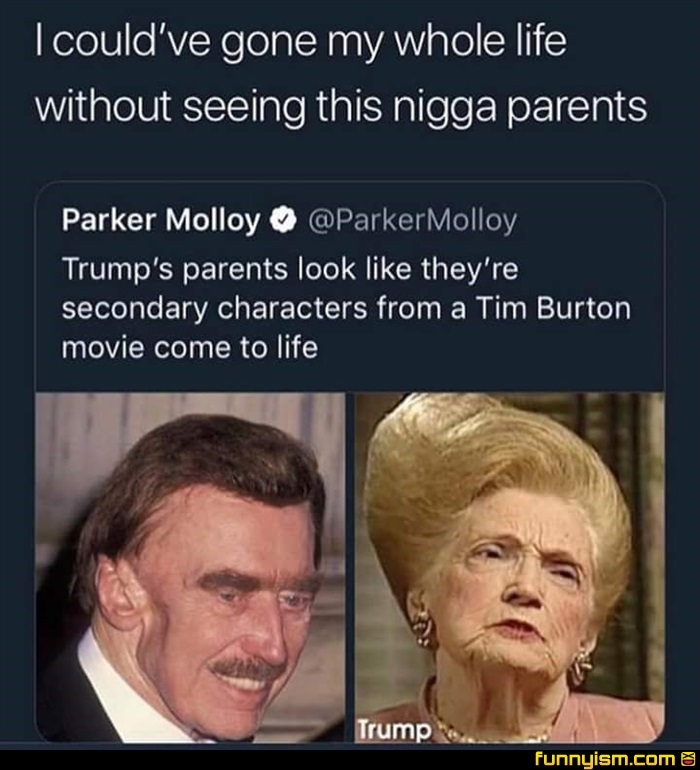 Trumps parents are weird lookin!" Repubs : "Clearly All democrats are bullies too." Dont blame the majority for the actions of the minority. Not all dems are socialists. Not all repubs are racists. Not all christians are godly. Not all muslims are radical. Not all Americans are good. Not all immigrants are evil. @PoliticalOtters, one person posts a picture on twitter and it's an article? @PoliticalOtters, You don’t even know if they’re leftist. Doesn’t take a political alignment to agree that those are not good-looking people. @Erebus, if, I, can, read, through, all, them, commas then yes. It is bullying if you bully a bully. Also, the moral justification of what comes around goes around requires a non-concerned party to act, if another concerned party acts you just have another jerk and another victim. Great, political conversations....yay....look, it comes down to this. If you lean too far either way politically then you're the problem. Simple as that. There's no political party in existence that is completely beneficial to a people. Either be right in the middle and take into account both sides or stay out of politics. I don’t want to sound insensitive so please correct me if I’m being ignorant... but is his face falling off? What the heck happened to that dudes head?!!!!!! Mothers face and fathers hair. I see it. Poor parents. So much is suddenly explained.